Jim, Ellen, Jimmy, Sarah, Zachary, and Katie. Our home...the house with dark roof just right of center. Jim & Ellen...Keepers of this zoo. I am a typesetter for a publisher of Civil War books. Favorite passtime is to do some hunting for Civil War relics with a Fisher 1266-X. Other activities include AYSO U-8 soccer coach, scouts, and picking up toys from the floor. My wife Ellen is a freelance medical editor. Her favorite things are reading a good book (probably from QPB) and to go bike riding. Other activities are scouts, fiction writing and, ummm, nothing, she has to get back to work...life of a freelancer! 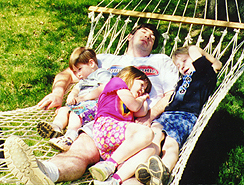 Jim, Zach, Sarah & Jimmy (left) relaxing. Ellen (right) looking good! 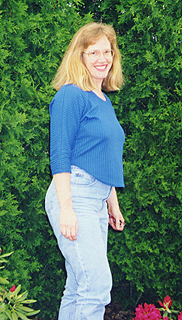 October, 1998. 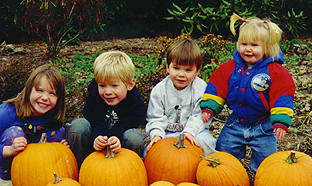 Sarah, age 5...Jimmy, age 7...Zachary, age 3...Katie, age 1. Jim's Civil War relic "tour"